EVERYTHING BEAN'RE: In 2017 I'm going to "Share the Wind"
In 2017 I'm going to "Share the Wind"
I've known for years how much fun sidecars are. I ran one for a year back in 2002. I rode my little brother in mine from Kentucky to California and back. 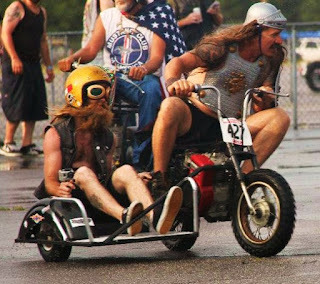 He had the nickname "Sidecar Bob" for years because of it. I even got to take my mom on her first motorcycle ride with me as she felt safe in a sidecar. The problem is that it changes the riding characteristics of a motorcycle, mainly because you can't lean the bike anymore for turns. For this reason I removed it and gave the sidecar to a couple with a special needs child. Well now for next year, I will be putting a sidecar rig back into action and will be doing a program that I call "Share the Wind". I will be visiting hospitals, retirement homes, Veteran homes and anywhere else where people are that would like to ride and get in the wind but are unable to do so on their own. My plan is to arrange at least one visit in a town where I am at during my travelling to rallies across America. I will also implement this in Nova Scotia Canada The Wharf Rat Rally where I already visit 7 adult living facilities and hospitals. I don't want to do this alone. The more, the merrier so I will be asking that anyone who would like to come along is welcome but would REALLY like it if you also have a sidecar or a trike. A simple ride around a parking lot can make someones day more than you can ever imagine. I will testify that it can also warm your own heart and leave a good feeling that lasts a lifetime. I have a Facebook page for this called Share the Wind. Feel free to go there and click "like". Watch for new things in the very near future. I also want to acknowledge some friends that are also putting together a sidecar event. Their page is The Sidecar Soiree. Their first even in the end of March with more on the way. It looks like 2017 is going to be interesting to say the least. Let me know when you are in So. Cal. I have my trike and can put a back rest on it. I sold my Ural and do miss it because I got the trike. I think what you are doing on Share The Wind is just great!